Finance provides the tools for management of cash, reconciliation of accounts, processing credit card transactions, recording payments and making deposits. In addition, the Nextsoft system is ready to record wire transfers, ACH and other electronic transactions which do not include a paper check. By keeping all accounts balanced and reconciled, you will insure that the other areas of your business are being processed correctly. An error in a subsidiary area of the system can result in an error to cash, so daily monitoring and reconciliation is the check and balance for the entire financial system. Nextsoft allows you to create multiple cash, checking or investment accounts for tracking funds. Each account register shows all activity for the life of the account, including dates, type of activity, and running balance. Drill-down inside the account to open and view the original transaction, deposit, payment or adjustment. Check printing includes a preview so you can see the checks before sending to the printer. Nextsoft’s Form Designer allows you to create your own check forms complete with logo, colors and other design elements. Account balances are updated in real-time as activity occurs throughout the system, and all activity is maintained on-line forever. Customer payments can be in the form of check, cash, credit card, wire transfer or ACH. Complete deposit slip details are available by simply opening the deposit line in the account register. In turn, this detail can be opened to reveal the original customer payment and associated invoices. A deposit slip is generated automatically as you prepare to take the deposit to the bank, saving time and errors. 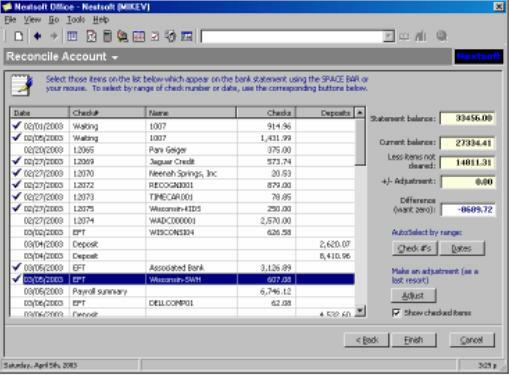 The Bank Reconciliation process is brief, and should be completed immediately upon receipt of the bank statement. Recurring items or other funds which are drawn from the account automatically can be setup through the Recurring Transactions function, making the reconciliation process easier. 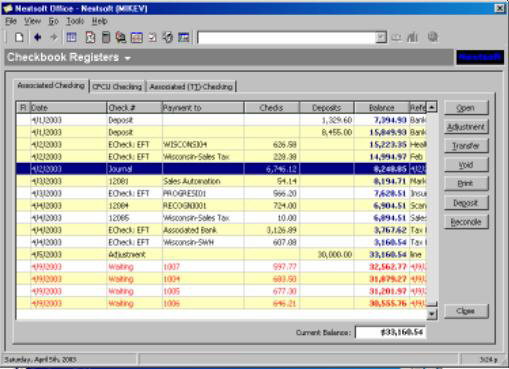 Nextsoft calculates the outstanding balance of uncleared checks and deposits, and compares to the statement balance. Uncleared items remain unchecked in the account register to help identify lost checks. The Nextsoft Datacenter includes the ability to setup merchant services for your company, and process your customer’s credit cards through the Nextsoft system. By capturing account numbers and expiration dates during the data entry process, the system can automatically submit the transaction for authorization, and settle at the end of the day. Settled batches appear in the checkbook register, along with complete customer payment details. Credit card processing through the Nextsoft system eliminates the need for the swipe terminal currently in your office, and allows employees from any location to enter credit card sales and receive authorizations. All settlement activity is completed daily by the system. Contact our Sales Team at sales@nextsoft.com for additional information on merchant credit card processing. For International sales whereby you are paid via wire or ACH, the customer payment form allows recording of the wire or ACH reference number in lieu of the paper check number. Electronic payments and supporting detail appear in the account register along with all other payments and deposits. Nextsoft can create ACH formatted payments for submission to your bank, in lieu of printing checks. You still decide when to pay your vendors, but submit a batch of ACH transactions to your bank’s website instead of generating a batch of checks to print. Contact our Sales Team at sales@nextsoft.com for additional information on ACH submission. Your employees can choose to use direct deposit for payroll by supplying you with bank name, router (ABA) number and account number. Upon completing payroll, those paychecks which were configured for direct deposit will be compiled into an ACH file ready for transmission to your bank’s website. Nextsoft provides direct deposit print functions so these employees can still receive a printed paycheck stub. Contact our Sales Team at sales@nextsoft.com for additional information on direct deposit.